For all the social media “friending” and “connecting,” there is a crisis of friendship in the world today. The trivialization and/or sexualization of the concept of friendship is an increasing problem in our culture. Families and catechists must do everything in our power to foster healthy friendships in the lives of the children entrusted to our care. 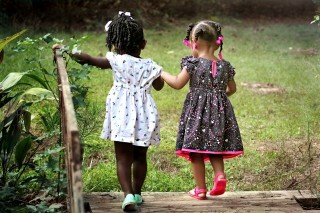 Like everything in children’s lives, their understanding of what it means to give and receive friendship begins at home. How can parents offer children the experiences and skills they need to construct a good foundation for healthy friendship? The four cardinal virtues, when practiced in our families, enhance our ability to be present to children and develop other virtues that help them live in friendship with others. Here we identify some intentional ways that parents can cultivate virtuous living and healthy Christian friendships in our children. 1. Prudence helps families limit activities to the essentials and let the rest go. Before making a commitment to a new activity, consider what virtues the activity will foster. If we allow each family member to choose activities without considering how their involvement impacts their relationships with parents and siblings, we may find the whole family rushing from one commitment to the next and only vaguely aware that we are missing out on crucial opportunities for self-reflection, meaningful conversation, and the enjoyment of silence. Overscheduling children’s lives impedes their ability to engage in imaginative play and/or to appreciate the spiritual and relational benefits of silence. Skilled at a variety of activities and oriented toward tasks, they may become accustomed to pushing aside their inborn desire to know another and be known. Some may pressure themselves to master skills they mistakenly believe will earn approval. Others may look to relationships outside the family to meet their most primal need for loving acceptance, resulting in unhealthy ways of relating. A frenzy of activity cannot allow for the slow, patient development of authentic friendship which is meant to begin in the context of family life and grow outward from there. 3. Temperance helps us limit the intrusion of technology into the life of our family. The presence of two people is the minimum pre-requisite of the true encounter encouraged by Pope Francis. We are to help a child be present to himself or herself, to God, and to others. We do this first by being present to the child. We turn our attention away from the all-pervading screens and offer our children the tenderness they deserve. As parents, we may be in the same room with our child, we may even eat at the same table; but if our minds are distracted by electronic communications, we cannot listen to the thoughts and desires of our child’s heart. It is impossible to check the score of the game and be fully present to another person at the same time. To be fully present to others, we must behold them with love. An important question arises here for us catechists: how can we collaborate with parents in laying a good foundation for healthy friendship in the lives of their children? As catechists, we can explain and encourage parents to form the intentional habits mentioned above, as well as incorporate them appropriately in our own classrooms. For example, when we are tempted to text a family member about something “quickly before I forget” while children are arriving for a catechetical session, let them see us putting our phones away to give them our full attention. This shows them that our time together in Christ is important, that they are important. Is he saying that through catechesis people will become intimate friends with Christ? Yes, Jesus desires to be the personal Friend of each child we catechize. So, we are compelled to help children discover for themselves the Mysteries of the Trinity, Creation, the Incarnation, Passion, Death, and Resurrection of Jesus. For it is by entering into these Mysteries through Sacred Scripture and the Sacred Liturgy that we enter into this intimate communion with Christ called friendship. Before we introduce to the children the idea of friendship with Jesus, we can make certain we cultivate in our own hearts the deepest reverence for the child’s capacity for a serious relationship with God, and for the Mysteries of Faith. Without this fundamental respect, children may understandably conclude that friendship with Christ consists of nothing more than trite or sentimental words removed from the realities of their everyday lives. Friendship with Christ is a new way of thinking and willing and the way our students will become truly themselves. When children construct their lives on such a firm foundation, they will be well equipped to make of themselves the sincere gift that true friendship requires. Lani Bogart oversees all things catechetical at Our Lady of Perpetual Help, a mostly Hispanic urban parish in Glendale, Arizona. She holds an MA degree in Theology. She also co-leads the Committee to Serve Wives and Widows of Deacons for the Diocese of Phoenix. [i] Pope Francis, Message for the 48th World Day of Social Communications: Communication at the Service of an Authentic Culture of Encounter, June 1, 2014. [ii] John Paul II, Catechesi Tradendae, art. 5. [iii] Pope Benedict XVI, Homily at the Vatican Basilica, June 29, 2011. Art Credit: Public domain image from Pixabay.com.